Thursday Moda #21 and All American Blue Denim. 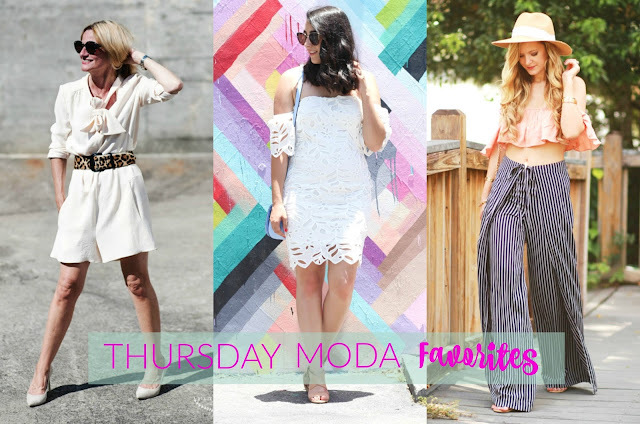 Welcome to another Thursday Moda. Hope the first half of your week has gone off nicely, so far. Today's Co-Host is LEE from Wine and Couture. You might remember her co-hosting with me once before, a few months ago, when we both styled Peach Tops and that was one of my Most Favorite Outfits of this entire year, also. 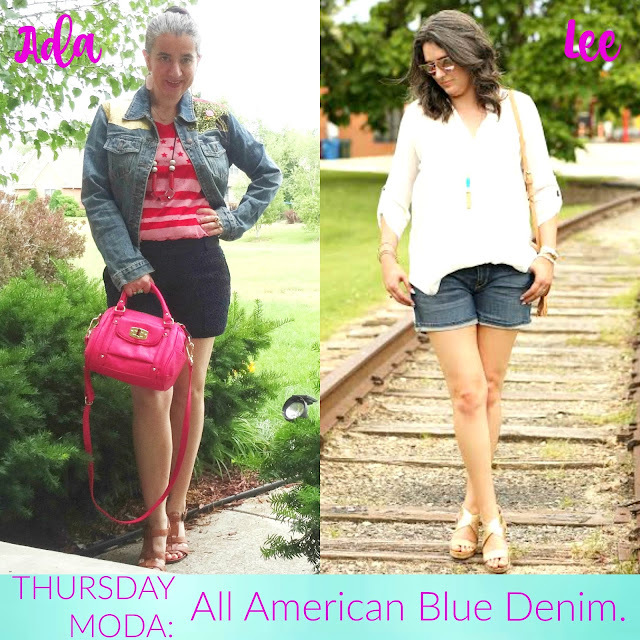 Well today, we are all about Blue Denim and All American Looks. 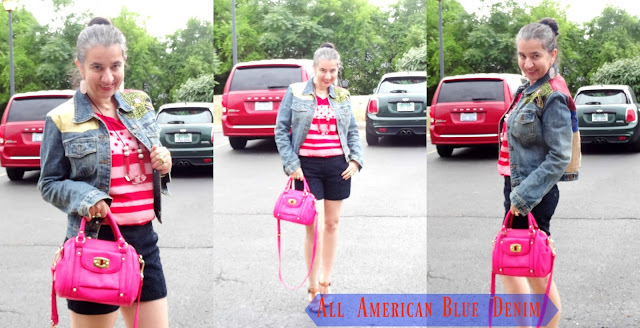 I am wearing Navy Lace Shorts with a Stars+Striped Red Graphic Tee and a Patchwork Denim Jacket on top, while Lee styled Blue Denim Shorts with a Sophisticated Cream Blouse. Between both of us we got the colors of America - Red, White and Blue - covered. We even wore Neutral Sandals (just like we wore back then, when we collaborated). Great minds think alike, no?! Lee has been blogging for the same amount of years as I have (4+) and she has fabulous style. From office-chic and elegant, to casual, easy and bohemian she does it all. She has had some great changes going on in her life lately: a new job, a new awesome haircut and even celebrated her 12-year Wedding Anniversary, so go check out her blog and see what she is all about. Long Beaded Statement Necklace w/ Red, Clear & Tan Large Beads on a Navy String: Loft (New) (similar as a set, Steal), (similar, Fantastic Deal), similar, Great Deal, love this). Cognac/Camel Real Leather T-Strap Sandals w/ Cone Block Heels: Naturalizer (similar, Steal), (similar, on Sale, love these), (similar, Great Deal), (similar, Splurge). Hot Pink Faux Leather Satchel Bag w/ Crossbody Strap: Target (New) (similar, Steal, love this), (similar, on Sale, my Favorite), (similar, huge Splurge). Gold-Tone "Hadar" Ring w/ Square Torquoise Stone: Elise M. via Rocksbox (New) (same in olive), (similar, Steal, love this), (gorgeous option, Great Deal), (similar, huge Splurge, love this). White Stretchy Bracelet w/ Small Square White Stones (part of a bundle): Forever 21. Gold Wedding Ring and Gold w/ Diamond Engagement Ring: From my Husband (Albania). Gold-Tone Ring w/ Large Knot: Old Navy (New) (similar, Steal), (similar, Great Deal), (similar, Splurge). 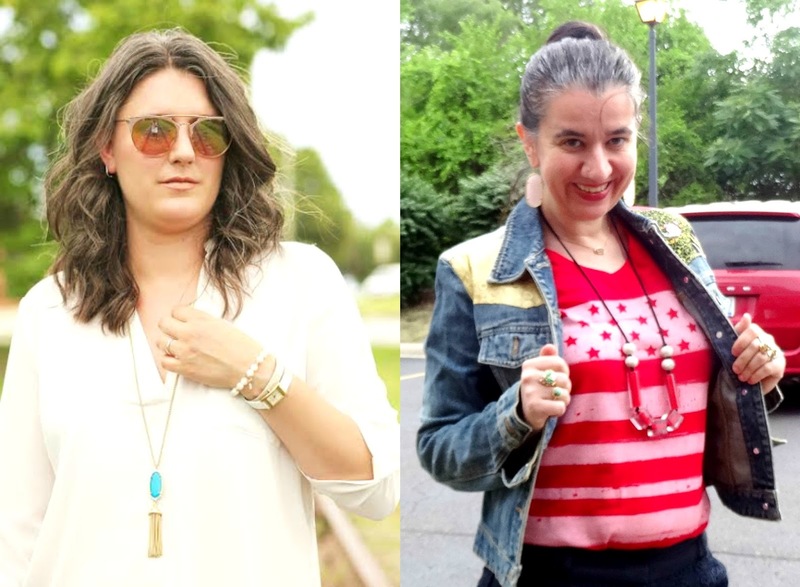 Red w/Pink Stripes+Stars, Short-Sleeve Graphic Tee: c/o American Flair (a local boutique) (New) (similar in white, Steal), (similar, Fantastic Deal, my Favorite), (similar, on Sale, love this), (similar sleeveless option). Medium-Wash Blue Jean Jacket w/ Silk Patchwork Back: Gap (similar, Steal, my Favorite), (similar, love this), (similar, huge Splurge). Navy Satin+Lace Dressy Shorts: The Limited (dressy lace-trim option, Steal), (similar, on Sale), (similar, love these), (fun ruffled, dressy option, Splurge, my Favorite). Navy Blue Skinny Lucite Bow Barrette: c/o an Accessories Boutique in Albania (similar, Great Deal), (similar in satin), (similar, Splurge, love this). Dangly, Oval-Shaped "Danielle" Rose Quartz Earrings: Kendra Scott via Rocksbox (New) (identical), (very similar), (similar, Great Deal), (similar, Splurge). Dainty Oval-Shaped "Elisa" Necklace in Rose Gold Druzy: Kendra Scott via Rocksbox (New) (identical, Splurge), (similar, Huge Steal), (same in silver druzy, love this), (similar). 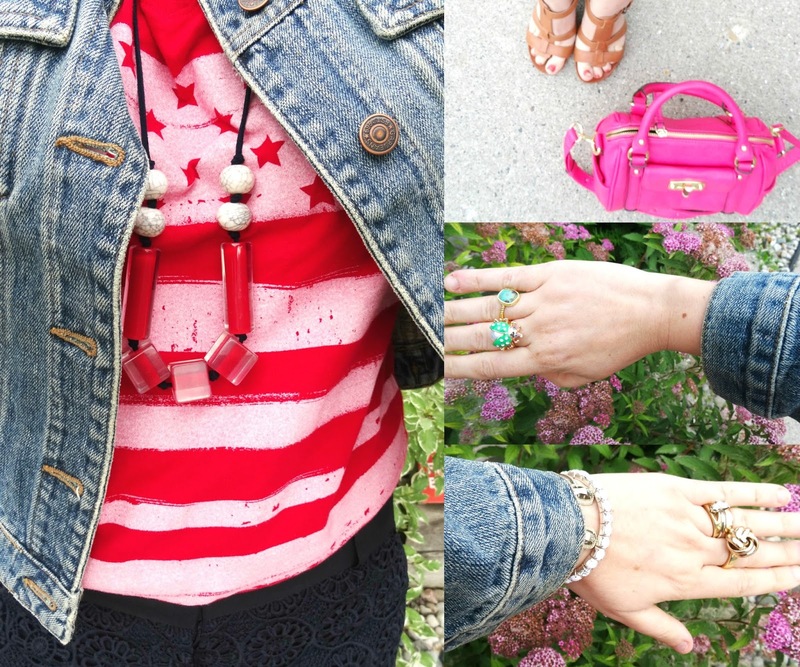 Today's featured Blogger is ASHLEY from Le Stylo Rouge not a stranger to either my blog or Thursday Moda. She has been blogging for about 5 years and I have followed her for about 3. 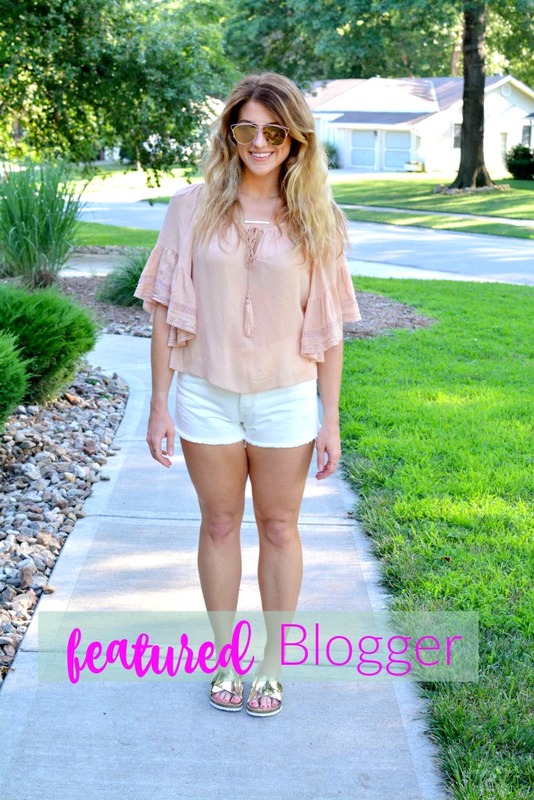 Ashley linked up this Blush+White+Gold Casual Outfit I am dying to wear this very minute. I fell in love with her sporty and street-chic Gold+White Slide Sandals and that Floaty Blush Blouse. There are many words to describe Ashley's fabulous style but the top four I would chose are: modern, sporty, edgy, cool. She is one of those people that can wear anything and look good in a sac. Her legs are amazing and I dig the way she words her posts. If you haven't had pleasure to discover her yet, go visit her blog NOW. I mean it in the best possible way. Yvonne revealed her 'Jumpsuit Secrets' wearing an elegant cream one styled two different ways with two different pairs of pumps. Alicia's 'Little White Dress' is one of the best I have ever seen. The oversized Lazer-Cut Eyelet material is stunning and such a lovely girly style. Only Shannon can pull off double-layered Palazzo Pants paired with a Panama Hat and a Cropped Off-Shoulder, Bell-Sleeve Top. She balanced 'Stripes & Ruffles' beautifully. As I mentioned, Lee is a Style Chameleon as all these three very different recent looks showcase and I love every single one. She even wore her hair differently, each time. "Wine and Couture started almost 4 years ago as "Everyday Fashion". 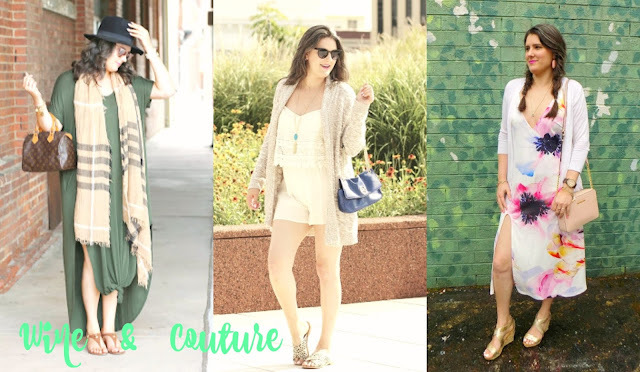 I started the blog as a fashion / restyle blog which has grown into a Life and Style blog including Fashion, Recipes, and Beauty. I love sharing how to shop your closet and purchase items that will work for all aspects of your life. 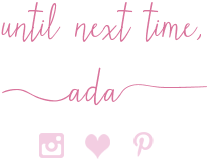 You can find me on Instagram, Bloglovin, or Facebook. Stop by and say Hello!" With Summer being as busy as ever, and also taking some time off and vacation days the first couple of weeks in August, I am looking for about 4-6 Guest Bloggers and also I am looking for co-hosts for Thursday Moda. So let me know if you are interested to do so and therefore have your blog be exposed even more to new readers and new fans. My readership has grown daily and that is thanks to you who visit me and also linkup with me on Thursdays. You can let me know if you would ever like to Guest Post, Collaborate or Co-Host with me, by commenting on my blog or e-mailing me. You can find my E-Mail and Contact information here. Thanks again. If you read all of this, I give you props!! Summer is half-way over. Let's enjoy the rest of it! !